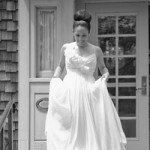 New Jersey Wedding Photographers - NJ NY Photography | How to be on time to your wedding? How to be on time to your wedding? There seems to be a new trend developing in modern weddings: Being late. This year, 80% of our weddings have started late, which has me thinking. Is there a new wedding etiquette that I’m not aware of. Or is there a wedding reality TV show laying out that it’s OK for the bride to be late. The answer is simpler. Since we are in a DIY era, brides, who are not hiring wedding planners, are preparing out their own wedding timelines. And when creating their timeline, brides are not factoring things that are part of a wedding day, but not part of the ritual, like greetings, bustling, retouching, walking and the unexpected; in some cases, brides are not adding traffic to the equation, and if it normally takes them fifteen minutes to go from their house or hotel to the ceremony site, they are only factoring fifteen minutes. The result is brides being consistently late. A wedding timeline is like the mechanism that makes a clock work, if you offset one thing, it will offset the rest. Since the end time is the only thing that will not change, by adding time to certain parts of the day; you are taking time away from other parts. The result could make your wedding experience a little less enjoyable for three main reasons. First and most importantly, you may feel that things are not going according to plan. Second, you may end up paying over time to vendors, one example will be the limousine company. Third, you could feel the pressure of being pulled in every direction starting with family wanting to congratulate you and take pictures with you, the venue who wants to make sure you are taken care of, the photographer who needs to take your formal and family portraits, and you and your husband wanting to spend their cocktail hour with their guests. How to avoid being late to your own wedding? In an optimum world, the best solution would be to hire a professional wedding planner or day-of wedding coordinator, and having a friend who has been a bride doesn’t count as a wedding planner because a wedding is like a play: there is a whole production and crew behind scenes making a wedding happen that most brides and guests are not even aware of. But the reality is that if a bride didn’t think of a wedding planner from the very beginning, most likely, she will not hire one. How can I help my future brides sans planners enjoy their wedding day? I really do care about my brides, and I want them to enjoy their weddings. It also makes my job as a wedding photographer easier because the happier they are, the better the pictures. And if everything runs according to plan, the more time we have for pictures. 1. Apply a five, ten and fifteen minute rule to your wedding schedule. That is, if you think retouching your makeup will take 5 minutes, add 5 more minutes; if you think bustling up your dress will take ten minute, add ten minutes more, and if you think the ride from the hotel to the church will take less 15 minutes, add 15 minutes more. 2. Makeup and hair is what delays most brides, so round up makeup time for bride and bridesmaids to one hour each, specially if you are getting eyelashes. Depending on the number of bridesmaids, you may need two makeup artists. 3. Allocate two hours to your hair, and if possible have your hair done where you are getting ready, so ask your hairdresser if he or she would consider going to you. If that is not an option, allow yourself enough time for getting from point A to B. 4. If possible try to get ready at the venue, or at a very close hotel to avoid traffic. 5. If you are getting married at the venue, schedule arriving half and hour before. So do yourself and your fiance a favor and make an extra effort to be on time. You will enjoy your wedding more, you will save money, you will have more time to eat and party, and that happiness will be captured in far more pictures. Please feel free to add your two cents by posting a comment to help future brides.